It’s the same in law as it is in sports: great performances build on good practice. For young attorneys, though, opportunities to practice depositions can be scarce, especially in real-life settings. That’s because litigation is increasingly focused on bet-the-company matters, and in those matters, senior litigators take center stage. Still, mid-sized and larger firms often provide young associates with critical training on how to take depositions. Associates are coached on what questions to ask, how to ask them, and how to think strategically. Although training is the next-best thing to doing, there’s one critical shortcoming: what associates can’t typically see in deposition training is the fruit of their own performance – the deposition transcript. 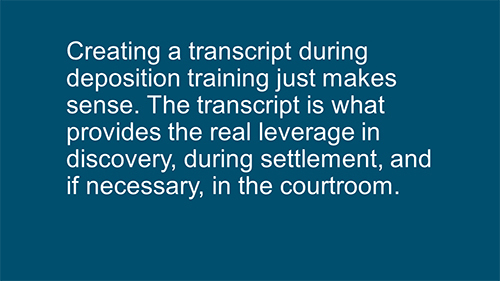 The transcript is what provides the real leverage in discovery, during settlement, and if necessary, in the courtroom. The transcript is unforgiving and can teach much to a young lawyer. One thing a lawyer really wants from depositions are clean quotes in the written record that are so persuasive they replace paragraphs of written or spoken argument. You want the critical sound bite that defines your case, motion, or argument. As we’ve seen in some of America’s most notorious cases, one unforgettable line is worth thousands of hours of testimony. 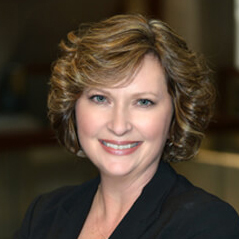 Capturing the sessions on video can teach associates even more about the art of the deposition. They can see their body language, attire, demeanor and gestures as others see them. With video, associates can also observe deponents’ reactions to see if they match the questioner’s intent. For example, if you’re trying to get a witness to feel safe and open up – yet you’ve crossed your arms tightly across your chest – the deposition is not working the way you intended. In real cases, transcripts are where the rubber meets the road. Why not include them in training? That way, young lawyers will really know how they’re performing in their cases. A transcript provides them with the very same product created precisely the same way that a real deposition would appear with an official written record. And how do you get a transcript for training purposes? Simply include a court reporter in your deposition training sessions. Why not? Were the questions artfully asked in a concise way? Was the attorney eliciting clean, clear responses from the witness? If not, was the attorney following up to eliminate ambiguity? If the witness opened additional avenues for questioning, did the attorney take advantage of them? Or was he or she perhaps too focused on asking the next question? Are there verbal tics that appear consistently through the record? As in real proceedings, a court reporter can read back the verbatim transcript in training. Were the transcribed words meaningful enough? Did that verbatim record really show that the attorney achieved his or her goal? Later, the transcript can help the instructor and partners customize training and coaching to each attorney’s needs. After speaking with court reporters throughout the nation, the number-one suggestion we’d offer to young lawyers is don’t come into the session with a long list of questions to read. Rather, the best deposers are the best listeners, and they pick up on potential new paths of inquiry as they go. A written transcript can validate this principle and spotlight areas of improvement needed. To depose well, a lawyer needs an endgame in mind. They need to depose with a purpose. And they need a chance to work out the kinks before it really counts for their clients. Inviting a court reporter to your next deposition training is a good way to start.